Today’s leading organisations are adopting new digital strategies to simplify processes and transform their businesses. You need an intelligent secure network that can advance this digital transformation by providing access to any application in minutes and gaining superior awareness of what's hitting your network, without compromising on security. Cisco Software-Defined Access (SDA) provides a single, highly secure network that makes all this possible. Let Fast Lane design your SDA Implementation and Deployment plan today! 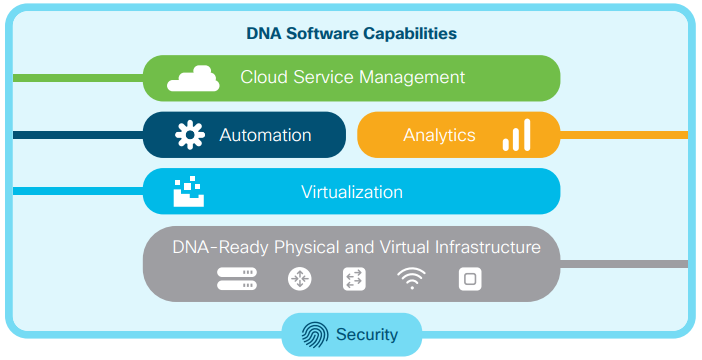 Cisco® Digital Network Architecture (DNA) is an open, extensible, software-driven architecture that accelerates and simplifies your enterprise network operations. Cisco DNA automation is built on a Software-Defined Network (SDN) controller, rich contextual analytics, network virtualization and the limitless scalability of the cloud. With Cisco’s DNA products and solutions, such as SD-Access, Cisco Intelligent WAN (IWAN), SD-WAN and network security, you can join the new era of networking. The Network. Intuitive. With Cisco and Fast Lane’s Exclusive course portfolio, we have all your training needs covered. See below for more detailed information on our DNA related courses, or email services@flane.co.uk to discuss your current training requirements.